NMWA’s Director’s Circle membership level offers the opportunity to travel with the museum’s director, Susan Sterling, on unique trips that highlight the work of women artists. Past destinations include Napa Valley, Spain, and Miami. The Director’s Circle just returned from a three-day trip to New York City (March 2-4) that focused on contemporary art, and it was my pleasure to travel with them. Our group spent two afternoons at the renowned Armory Show staged on New York’s Piers 92 & 94. An annual international art fair, the Armory Show highlights important art from the early twentieth century to today. This year’s fair featured nearly 300 booths presented by galleries from Berlin to Zurich. We loved seeing works by artists whose careers we have been following—such as Julie Blackmon, Berlinde de Bruyckere, E.V. Day, Susan Hiller, Lori Nix, and Yayoi Kusama—as well as artists who were new to us, especially painter Kyung Jeon and Isabelle Fein, whose mesmerizing drawings filled the entire booth presented by Frankfurt’s Galerie Parisa Kind. We spent a morning popping into galleries in the Chelsea district and were knocked out by exhibitions showcasing art by Tara Donovan and Hope Gangloff. At Cheim & Read, where we saw breathtaking large-scale paintings by Pat Steir (whose work is in NMWA’s collection), we were granted access to a private area of the gallery that featured remarkable pieces by Louise Bourgeois and Joan Mitchell. 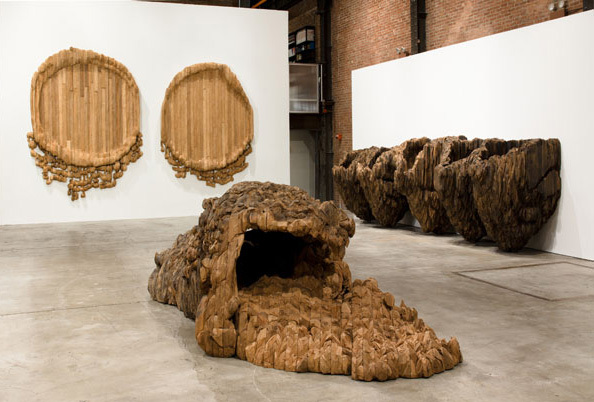 During an “away day” in Queens and Brooklyn, we attended a private breakfast reception at the Sculpture Center, where we viewed a retrospective of sculptures by Ursula von Rydingsvard (also part of NMWA’s collection). Our tour of this exhibition was led by Rydingsvard herself, and afterwards she chatted with the NMWA group and signed everyone’s exhibition catalogues. Yes, we felt like groupies—it’s always exciting and enlightening to meet artists in person. Also in Queens, we were delighted to have MoMA PS1 Curator Christopher Lew lead us on a tour of films and photographs by emerging artist Laurel Nakadate. At the Brooklyn Museum, Elizabeth A. Sackler Center for Feminist Art Curator Catherine Morris shared with us an exquisite exhibition of photographs and a video by Lorna Simpson. In addition to focusing on visual art, Director’s Circle trips delve into the culinary arts. We enjoyed dinner in the Four Seasons Restaurant’s Pool Room (site of the recent wedding of reality TV star Bethenny Frankel and Jason Hoppy—although I seemed to be the only one in the group who knew about this). Aside from the important business of learning more about women artists, Director’s Circle trips are about having fun. In addition to great food, we also shared many laughs. On our first day at the Armory Show, we discovered that a tiny 6 x 6-inch painting by a mid-century American master had a price tag deep into the six figures. Most of us were dumbstruck by this news, but one member of the group declared, “That’s absurd!” and got all of us giggling. Kathryn A. Wat is curator of modern and contemporary art at the National Museum of Women in the Arts. To learn more about the Director’s Circle, contact the Development Office at 202-266-2805. This entry was posted in Behind the Scenes, NMWA Members by Women in the arts. Bookmark the permalink.